A few years ago, De Putter & Co developed and implemented for MAN Truck & Bus, the importer of trucks and busses in Belgium, a MAN Quality Management System for its entire truck dealernet. 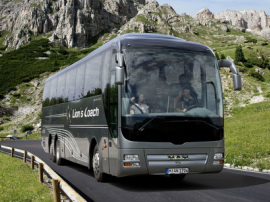 Vantieghem Bus & Coach, autobus dealer in Courtray, West-Flanders, decided to implement this quality management system and to obtain the ISO 9001 certificate, just like its MAN truck colleagues. This MAN QMS pays special attention to uniform processes and the accompanying KPI dashboard, which carefully manages the performances of sales, workshop, warehouse and administration. A fitting monitoring system for testing and calibration, and for the competences of its employees, is an essential part of the management system. After a close cooperation with De Putter & Co, Vantieghem Bus & Coach successfully obtained the ISO 9001 certificate. This has recently been confirmed by a follow-up audit.